Early 2011, the Internet Architecture Board (IAB) solicited position statements for a workshop on 'Interconnecting Smart Objects with the Internet', aiming to get feedback from the wider Internet community on their experience with deploying IETF protocols in constrained environments. The workshop took place in Prague on March, 25th, 2011. During the workshop a range of topics were discussed, including architecture, routing, energy efficiency, and security. 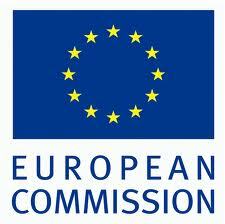 The workshop report summarizes the discussion and suggested several next steps. During the months following the workshop indeed a number of IETF initiatives were started, IETF participants submitted Internet drafts, and hands-on code hacking events at IETF 81 and 80 were organized to better facilitate the exchange of ideas. With the contributions on security in the IETF CoRE working group as well as in the IETF TLS working group it became clear that further discussions on security are necessary and that those will have to feed in implementation and deployment experience as well as a shared understanding how various building blocks fit into a larger architecture. The discussions in these two working groups only serve as a starting point. What techniques for issuing credentials have been deployed? What extensions are useful to make existing security protocols more suitable for smart objects? What type of credentials are frequently used? What experience has been gained when implementing and deploying application layer, transport layer, network layer, and link layer security mechanisms (or a mixture of all of them)? How can “clever” implementations make security protocols a better fit for constrained devices? Are there lessons we can learn from existing deployments? Note that this is a non-exhaustive list. In order to keep the group at a manageable size, participants are required to submit a position paper. The authors of accepted position papers will be invited to attend the workshop. Active participation will be expected. The workshop will be structured as a series of working sessions punctuated by invited speakers who will present relevant background information or controversial ideas that help participants reach a deeper understanding of the subject. The organizing committee may ask submitters of particularly salient papers to present their ideas and experiences at the workshop. For each slot, there will be one or two invited controversial speakers, followed by group work on the problem that’s identified, with a goal of reaching either a deeper understanding of the problem or some means of approaching it. Participation at the workshop is free of charge. There is no requirement to either register with or attend the IETF 83 meeting following the workshop. Nevertheless, we strongly encourage participants to make use of the opportunity to attend the IETF 83 meeting March 25-30 2012 where further discussions about technologies relevant for the workshop theme will take place. We would also like to point workshop participants to the Internet of Things CoAP Plugtest, March 24-25 2012 (which is also talking place in Paris, France). Every workshop participant must submit a position paper. A mail indicating that you are planning submit a paper will help us with the workshop planning, will allow us to give you early feedback and enables us to confirm your attendance faster. We are particularly interested to get contributions from security protocol experts, from implementers, and from those who deploy security functionality in smart object environments. Please keep your writeup short and to the point. Papers with 1 to 3 pages, formatted in HTML, PDF, or plain text (for example as a submitted Internet Draft) are ideal. Accepted position papers will be published (in addition to meeting minutes, and slides). Our email address for paper submissions, and any communication is <smart-object-security AT lists.i1b.org>. Due to the close relationship to ongoing IETF work the IPR policies described in RFC 5378 and RFC 3979 apply. You provide your name and your email address for the registration to this workshop. We use this information for planning purposes. We will also use this information to contact you about the location of the meeting venue, or other urgent and relevant notifications. Your name will also be listed in the meeting minutes and we also publish all position papers. The workshop will be held immediately prior to the IETF 83 meeting in Paris, see http://www.ietf.org/meeting/83/index.html, and will be hosted at Ecole Polytechnique in a close suburb of Paris, easily accessible by public transport. Here are the Directions for how to get to the campus. The recommended course of action is to reserve a hotel in Paris, and come by public transportation: hop on the RER-B (blue RER line) towards "Saint-Remy-les-Chevreuse", and get off at Lozere about 30 min later. At Lozere, there will be people with a "Smart-Object-Security" sign, who will guide you on a brief walk to campus, and to the correct lecture hall. 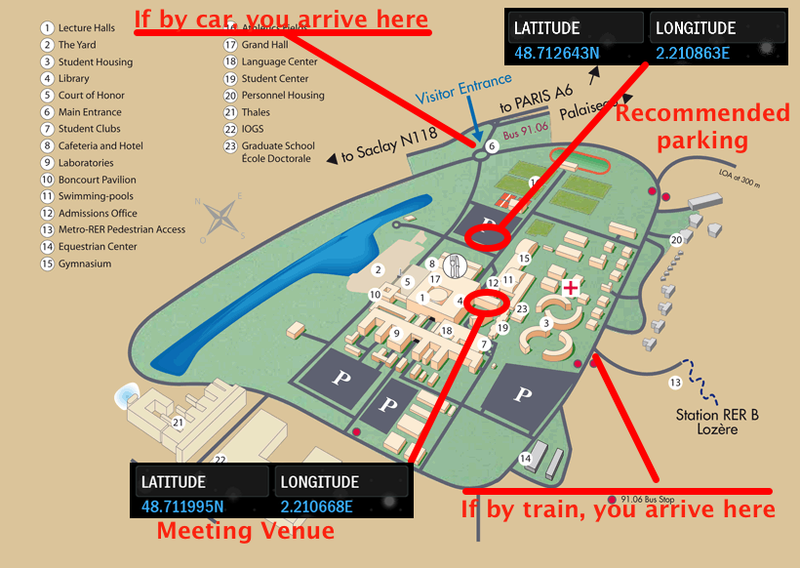 Here is a campus map with GPS coordinates, for you to find the recommended parking (if by car) and the lecture hall where we will meet. From the station, it's a 5-10 min walk to campus, and there will be somebody stationed at all decision-points (bifurcations) to help you not get lost. If you arrive outside of those hours, then you can call +33 6 6058 9349 (Thomas Clausen) for help in getting to the meeting venue. Do try to be on time, though (least, you will be also missing out on breakfast). In case of questions please send a mail to <smart-object-security AT lists.i1b.org>. Last edited: 18th January 2012.